When you’re dealing with a PC that is completely infected in viruses, sometimes the best thing to do is reboot into a rescue disk and run a full virus scan from there. 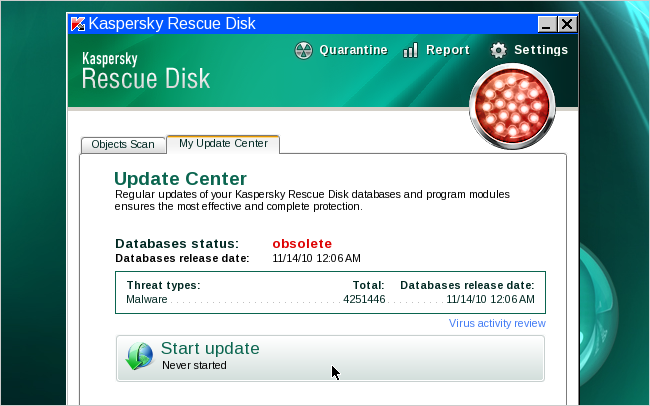 Here’s how to use the Kaspersky Rescue Disk to clean an infected PC. There’s lots of ways to clean an infected PC, like booting into an Ubuntu Live CD and scanning for viruses, but this is an extremely simple—and free—solution from a trusted anti-virus vendor. 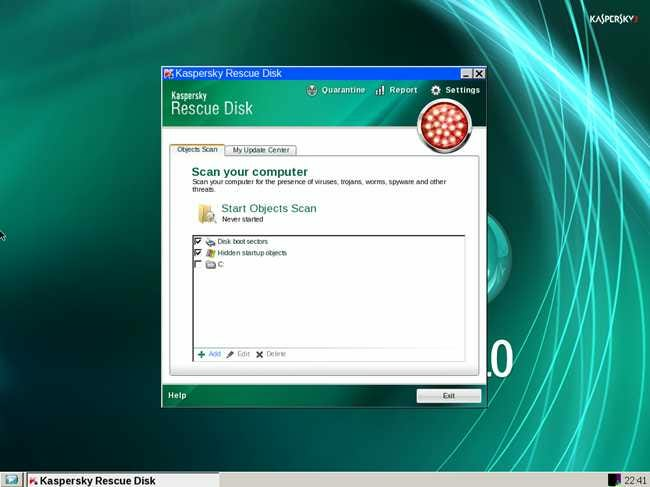 The first thing you’ll need to do is head over to the Kaspersky site and download the latest version of their rescue disk, and then use an application to burn that ISO image file to an optical disc—we prefer using ImgBurn (download from Ninite), but there’s plenty of ways to burn an ISO to a disc. Once you’ve got the disc in hand, put it into the PC and reboot—you should see a new screen that says “Press any key to enter the menu”, at which point you should probably press any key. To enter the menu, of course. If you don’t, it’ll boot normally into Windows. At this point you’ll be able to choose whether to use the Graphic or Text mode, and we’d recommend using the Graphic mode unless there’s some problem, which there really shouldn’t be. 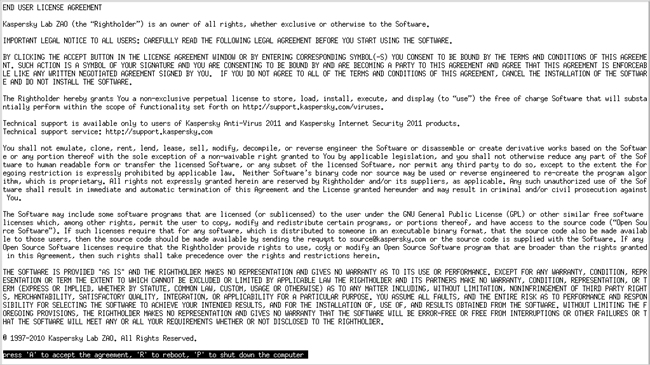 You’ll be prompted to type the letter “a” to accept the agreement. What’s weird is that it didn’t work with a capital letter “A” for us, even though that’s what it shows in the screenshot. Within a few short seconds you should see the full working environment, with the Kaspersky Rescue Disk screen front and center. The first thing you want to do is switch tabs over to the My Update Center, and then click the Start update button to load the latest anti-virus definitions from their web site—this is a critical step! Once done, switch back over to the Objects Scan tab, select the drives you want to scan, and then click the Start Objects Scan button. 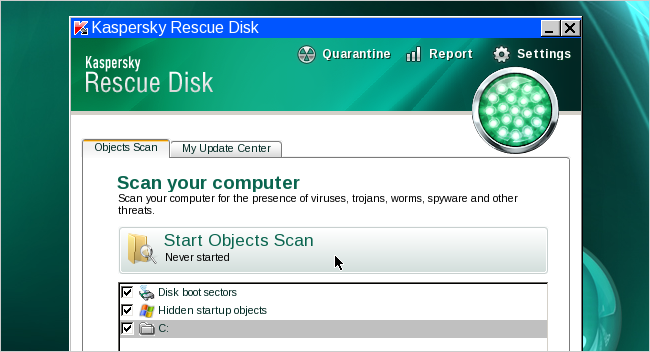 The scan will run, and clean up any viruses that it finds. 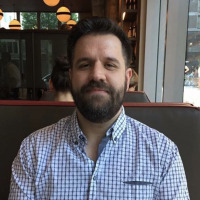 You’ll be prompted when you do encounter a virus, and you’ll have to choose whether to clean or quarantine the files—the typical anti-virus behavior. If you need to do some more work or research on the PC, you can access some tools directly from the menu below, which has a fully working web browser, command line, and a file manager. You’ll be able to access your Windows partition through the /discs/C: folder, and do any other maintenance work you need to do. That’s pretty much all there is to it. Enjoy cleaning viruses.